Recently, I made Beef Stroganoff from Thomas Keller’s Ad Hoc at Home Cookbook. It was time-consuming and incredibly rich, the kind of thing you want to labor over during a cold, wintery day. With a big snow storm currently pummeling Boston, I got another urge for something slow cooked and fattening. However, this is post-holiday time, and I’m trying to cut back on my excessive cream usage (at least, some of the time), so I turned once again to ATK, this time the Best of America’s Test Kitchen 2011. 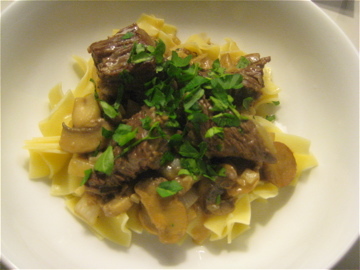 Their recipe for Steak Tips with Mushroom- Onion Gravy is hearty, much quicker/easier than any Thomas Keller recipe, and practically a salad when compared nutritionally to Beef Stroganoff. 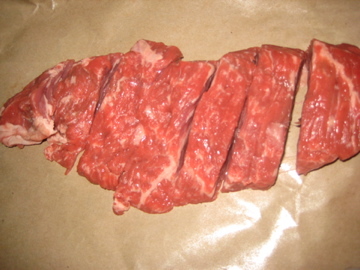 One tip I found particularly useful in the recipe: buy a whole steak tip steak and cut it yourself. The meat (see above picture) was incredibly tender after marinating for just 45 minutes in a mixture of soy sauce and sugar. 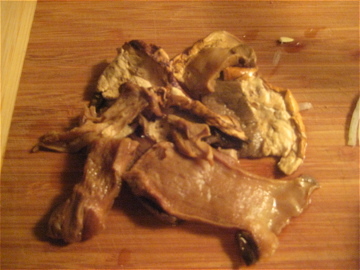 Another useful tip in the recipe was to cover dried porcini’s in beef broth and microwave for 30 seconds to reconstitute. This was a big time saver- I can see myself using this technique whenever dried mushroom’s are called for in a recipe. I will say that the mushroom-onion gravy was a tad watery, and I ended up adding 2 tablespoons of cream to thicken it/finish it off (hey, give me a break). I also think the amount of thyme should have been doubled, but other than that this was quick, satisfying, and rich-tasting without being heart attack-inducing. You could eat it on its own, but I used up some egg noodles I had hanging around. Hey Kate I received Ad Hoc at Home as a xmas gift. What an amazing book. Have you tried any other recipes from it? hey jamie! my mom made the roast rack of lamb and liked it, and I have been wanting to try to leek bread pudding. the one thing i find about that book is that everything has a million steps, but the finished product is delicious.